We went away for the weekend to: visit a cousin who had open heart surgery, attend a family reunion, and celebrate our 32nd Wedding Anniversary. After eating the ‘4 Meat Dinner for Two’ at “Jethro’s BBQ” and the breakfast buffet at “The Machine Shed,” Mr. Frugalfish said we needed to slow down on the amount of food and the cost. Then he took me to “Joe’s Crab Shack” and ordered the lobster/crab bucket and a piece of 6 layer chocolate cake! How was that slowing down? There is a difference between being cheap and being frugal. Cheap is eating at McDonald’s on your vacation. Frugal is paying cash…and 2 forks! 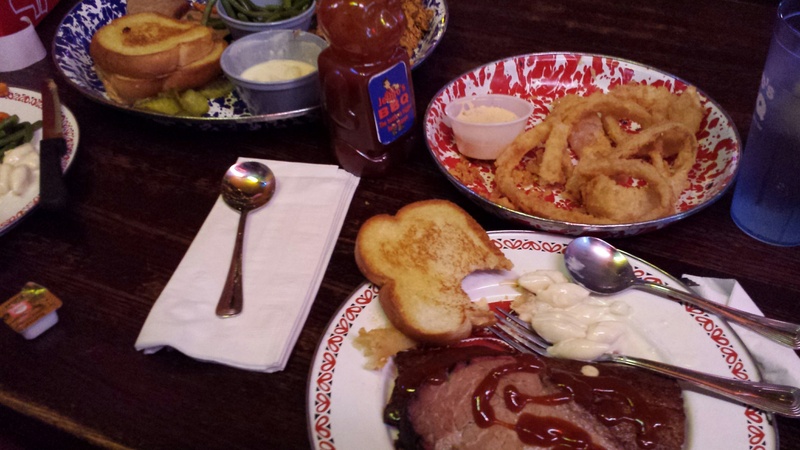 ‘4 Meat Dinner for 2’ at Jethro’s BBQ, Altoona, IA. This entry was posted in Accountability, Be Prepared, Food, Money Saving Ideas and tagged Accountability, Be Prepared, Food, Money Saving Ideas by Frugal Fish. Bookmark the permalink.